When given the choice between the medical field and teaching, it was easy for Jessica Hill to decide. Since her entire family was in the medical field, Hill originally followed in their footsteps and went to med school. However, she found that her passion was not in medicine, but in teaching. So instead of interning as a nurse, she interned as a student teacher during her final year at Sacred Heart University. While Hill originally applied for schools closer to her, she found that Woodland was a perfect school for her to intern at, with students and staff who welcomed her to the woods. During her time at Woodland, Hill taught five classes: two freshman honors classes with Jim Amato, one freshman CP course with Alissa Becker, one junior core class and one junior CP class with Becker. “When I came here, I fell in love. I absolutely fell in love. It was cool to see that even forty-five minutes away there were connections to my town. This school is amazing and everyone is so welcoming,” Hill said. When given the role of a teacher, Mrs. Hill was nervous about assuming this new role that she has been working towards; however, Hill thought that the students were so sweet and ready to learn, even with a new teacher. “Even when I made mistakes, as was expected, they were so forgiving and I was grateful for that,” Hill said. Both in and out of the classroom, Hill did her best to help the students to the best of her ability. 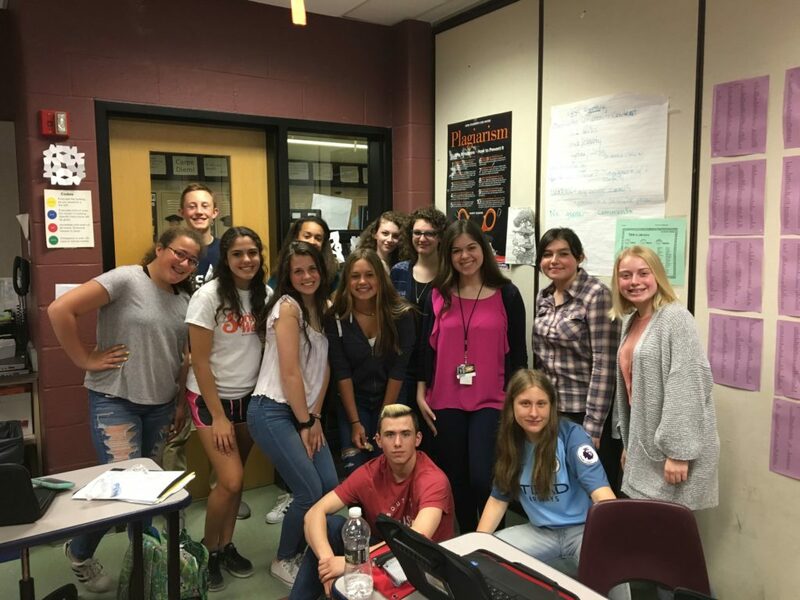 Her favorite memories are of the times outside of the classroom when she was able to see her students more in their element, as well as getting to know them on a more personal level. Hill’s favorite memory in the classroom was just watching her students grow during the time that she spent in the room, whether listening to the teacher or filling the role herself. “I knew teaching would be hard, but I had no clue what went into it. A lot of times we looks at the field of teaching and we take it for granted, the fact that we have so many people supporting us but the amount of things that teachers do, not only lesson plans and planning and researching and delivering these lessons, but creating for their students, sacrificing things for their students.” Hill has used many of the lessons that she has learned at Woodland to implement into her teaching style and that she can use in the future.